A wood burning pen kit is a basic tool- it's a device with a removable tip through which heat is transferred (Source). These wood burning pens provide adjustable temperatures for writing on different surface materials and different tips to produce different effects (Source). The most common surface is wood, but they can also work on surface materials like soft plastic, wax, foam core board, synthetic fabrics, leather, cork, hard plastic, wood, bone, paper, ceramics, foam pumpkins and plastic foam. You'll be able to swap out the tips for different effects for calligraphy, shading, and soldering, to name a few. The Walnut Hollow wood-burning tool kit features variable temperature control (0-950 degrees Fahrenheit), a heat shield for protection, a comfort grip build, as well as a stand. It ships with 11 interchangeable tips: Flow, Universal, Calligraphy, Tapered, HotKnife, Transfer, Solder, Shading, and 3 Hot Stamp Points. 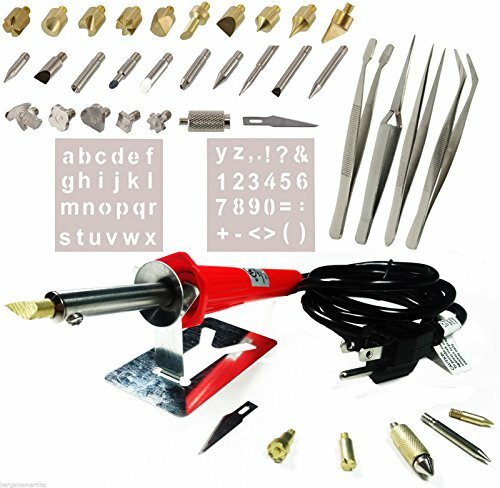 These points are swapped out using pliers- and are designed to perform woodburning, soldering, carving & cutting various surfaces like leather, card and wood. This wood burning pen offered by Walnut Hollow is well-designed, comfortable to use, and suitable for different surfaces including leather, card, fabric, and paper. Users love the variable temperature control that allows them to control the heat up to 950 degrees, but some do note that it tends to get hot. The Walnut Hollow creative versa tool measures 1.7” x 5.3” x 9.8”, and it features interchangeable points with a lead-free solder, a comfortable grip, a heat shield for extra protection, a stand, and a weight of one pound. Another great thing about this tool is that it comes with 11 tips, and it’s UL approved. A buyer comments that this wood burning pen is perfect for beginners and that it works wonderfully. He adds that after a couple of months he doesn’t have any issues with the tips and that it’s easy to adjust the temperature. Another reviewer observes that pen heats quickly and that the letters he carved are deep and dark in color. However, he notes that the instructions are lacking and he had to figure things on his own. A user adds that the Walnut Hollow wood pen is perfect for heavy-duty nylon fabrics and that he highly recommends it. However, some customers have complained that the heat dial is at an inconvenient place and that it’s difficult to set the right temperature. Some users also note that the burning pen didn’t last very long and that the tips burned out quickly. This short barrel wood burning kit offered by Weller is affordable, easy to use, and useful for a variety of hobbies and crafting projects. Users love the price and the comfortable grip, but some do note that there is no temperature dial. 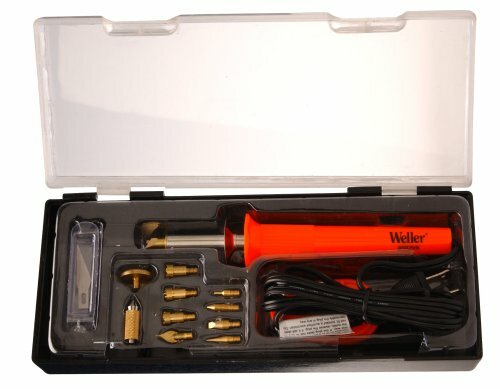 The Weller wood burning kit measures 9.8” x 3.9” x 1.7”, and it features a stainless steel barrel, a heat and impact resistant handle, a complete project book, and a weight of 12.8 ounces. Another great thing about this kit is that it includes nine wood burning tips, an embossing tip, a hot knife, and a stand. You can reach up to 900 degrees Fahrenheit with it. In general, users have a favorable opinion of the Weller short barrel burning pen, and they praise its performance. A buyer comments that the pen heats relatively quickly and that it’s far more powerful than he initially expected. Another reviewer shares that the different attachments work wonderfully and that it’s really simple to use it. She adds that the pen stays hot for a long time and that it’s easy to clean the tips with a brass brush. However, some customers have said that the handle gets very hot and that the tips are loose and burn very quickly. Some users also note that the wood burning kit is cheaply made and that it isn’t suitable for professionals. This wood burning set offered by SE is well-balanced, reliable and an excellent choice for wood crafting projects. Users love the accessories included in the kit, but some do note that the handle gets too hot. 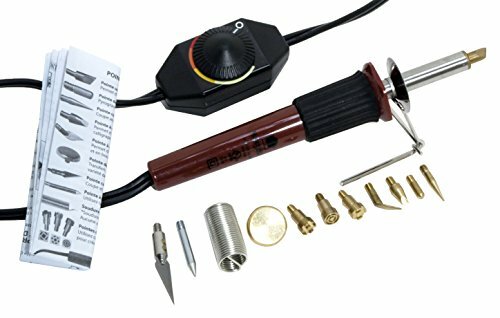 The SE wood burning kit measures 11” x 3” x 7”, and it features 34 wood burning tips, including ten assorted soldering tips and 15 assorted wood tips. Another great thing about this burning pen is that it comes with one soldering stand and four tweezers – extra fine, round angle, curved stamp, and extra fine tip. The SE wood burning pen is also UL approved. In general, users have a mixed opinion regarding the SE wood burning kit, and they agree that there is room for improvement. An unhappy buyer stays that while the handle can burn your hand, the tip doesn’t get hot enough. The reviewer also states that it takes him a long time to carve anything into the wood and that he doesn’t recommend this tool. Another user adds that the pen doesn’t heat consistently and that the tips are loose. Some purchasers also complain that they got burned while using the wood pen. On the other hand, a happy reviewer mentions that he achieves amazing results with the SE wood burning pen and that he doesn’t have any issues with the heat. Another customer also shares that the extra tips make this wood burning kit the perfect choice for a creative child and that she is very happy with its functionality. If you are looking for an affordable, but reliable wood burning pen, you might take a look at this creative woodburner offered by Walnut Hollow. Users love the on/off switch and that the pen heats up to 750 degrees, but some note that they have issues with the tip. The Walnut Hollow woodburner measures 1.5” x 1.5” x 7”, and it features a mini-flow point, a pen stand, a weight of 5.6 ounces, and a two-pin plug (120 volts). Another great thing about this tool is that it’s recommended for children over 14 (with adult supervision), and it’s UL approved for USA and Canada. A purchaser shares that she managed to burn names into wooden handles with no issue and that the tool is pretty simple to use even for someone who doesn’t have prior knowledge. She adds that the wood burning pen heats relatively quickly and that it stays warm. Another online reviewer mentions that the pen is perfect for home crafting projects because it’s cheap but efficient and that she highly recommends it. However, some customers have said that the pen doesn’t get hot enough to create beautiful, dark line and that it’s flimsy. Some users also note that tip broke very quickly and that you’d better have replacement tips available. This wood burning kit offered by Gochange is well-crafted, safe to use, and it’s suitable for both for beginners and professionals. Users love that the pen is easy to use, but some do note that there are no instructions how to use it properly. The Gochange burning wood pen measures 8.3” x 5.5” x 2.2”, and it features 22 assorted wood burning tips, a USA plug, and a weight of 8.8. To use this pen you need a 30-watt external heating type electric iron, and it’s suitable for burning, drawing, and decorating wood, leather, and cork. A reviewer mentions that the Gochange burning pen works better than she expected and that it doesn’t overheat. She adds that it’s perfect for wood art designs and that she highly recommends it. Another buyer observes that it takes only a few minutes for the pen to heat and that doesn’t cool down quickly. A user also notes that this is the ideal Christmas gift for any craft lover and that he is very pleased with the results. However, some customers have said that the handle gets hot to hold it comfortably and that the tips are poorly designed. Some users also note that there is no case to store the tips and that they are disappointed by the quality of the tool. The first wood-burning pen kit we examined is manufactured by Walnut Hollow. This particular kit comes equipped with 11 different wood burning points with variable temperature adjustability enabling arts and crafts professionals to easily control and adjust the heat for any different type of project. The way the tips work, these points can be swapped out using pliers- though the manufacturer advises being careful to not bend them when you are removing them. The wood burning points are marketed as capable of soldering, wood burning, as well as carving and cutting into a bunch of different surface materials like card, leather, and wood. It ships with a lead-free solder- the pen tips are capable of calligraphy, tapering, flow, universal, transfer, and hot knifing. Regarding the adjustable temperature range, it goes all the way up to 950°F. An integrated heat shield ensures that the hot barrel will not burn your hands. Great for hobbyists, you can screw in a hot knife points to be used with stencils, to trim fabric and to work with leather, soft plastic, cork, foam core board, wax and other materials. Buyers say that they use the tapered point for generating intricate designs across a range of different surface materials. The calligraphy woodburning point is great for creating attractive calligraphic lettering-enabling you to hold the wood-burning point at a 45° angle with the flat side of its point used to generate the fanciful lettering. The flow point is great for burning in darts, curves and performing in cursive writing. The shading point tool is designed to perform side shading as well as shading in a large surface area is without having to use a heavy touch. It's sold or in the point is designed to join a metal- though it is advised that you should tin your point before starting. Buyers say they have used it to cut vinyl records- employing the hot knife, though they advised to be careful of noxious fumes and to use a fume extractor. One pyrographer said that it is an effective and inexpensive tool to draw into wood at high temperatures-saying that it's adjustable tips provide dynamic engraving capabilities. He told us that it will take a couple of minutes for the tip to heat up and that as long as you don't apply to much pressure he hasn't experienced the tips breaking. One fine artist to engraves on wooden baseball bats tells us that it was an effective and relatively cheap tool for doing intricate a woodburning. The next wood burning pen kit we examined was the short barreled Weller. A Chinese manufactured option, it's capable of adjusting up to 900°F- and marketed towards hobbyists, craftsman and people who enjoy woodburning projects. One buyer told us that he used it on antler bones, saying that it was reasonably effective considering how much more difficult it is to work on that bone surface material than it is on common types of wood. Buyers say that in order to replace the tips they often use vice grips to swap them out. 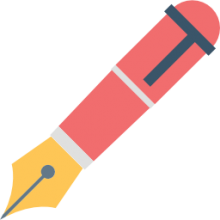 Craftsmen have a mixed feedback for this option, with one reviewer saying that after a dozen or so uses that the tip end melted into the inside of the pen, effectively ruining it. Indeed, the reviewer consensus seems to be that it is a relatively weak and poorly designed option that lacks an integrated temperature dial- best to go with something that costs a little bit more but provides a better return on investment. The third wood burning pen set we examined is manufactured by Sona Enterprises. It includes 34 different wood burning pen tips, four tweezers and is a 25 W option. One buyer who purchased this wood-burning gun was impressed by the number of pieces it shipped with, the included metal stand, and the stencils it ships with. As with some of the other options we examined, this kit has received mixed feedback, with one buyer saying he purchased it as a Christmas gift for a relative who loves crafts projects and found it an ideal starter option. 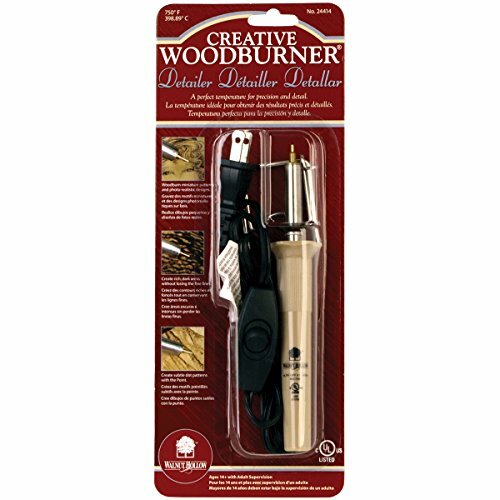 The fourth option we examined was the Hollow Wood burning detailer- it heats up to 750°F and is marketed as a precise woodburning tool. Once again, feedback is somewhat fragmented- one buyer told us he uses it for fine and crafts in his Christmas shop saying that it has been sufficient for his relatively basic detailing purposes. Some buyers complained that the tips wore out too quickly and that the included tips, as well, didn't provide the granular detailing ability they had been after. Indeed, you can find replacement tips- so it's likely that you can discover different wood burning tip options to get the effect you're going after. The last woodburning pen kit we examined is manufactured by GoChange. This is a 23 piece option- a pyrography set marketed as an embossing, carving and wood burning solution for home crafts professionals. For safety reasons, the company advises that it be used in a well-ventilated space in conjunction with a fume extractor to avoid damaging your eyes for lungs with noxious fumes. It's best also to use hand protection whenever you change the tips so that you avoid burning yourself. We are also careful to delineate that this is not a soldering kit- it is only a woodburning kit with temperatures that go up to between 200 Celsius to 300 Celsius. One buyer was somewhat annoyed that it didn't come with instructions and zero advice about what the different functions of the included tips are. On the plus side, he found it pretty effective, saying that though he has to wait a couple of minutes for the tip to cool down in order to swap it out that it doesn't smoke and has worked well for his purposes.